God just wasn’t relatable to me. Oh, I believed he was there, but only somewhere in the distance, unmoving and staring – kind of like the statues in my church. At least that’s how I thought about him anyway. And if that’s what I thought about God, then that was pretty much the truth, right? I wasn’t her friend after all. I already had Priscilla all figured out and knew that I didn’t want to be friends with someone like that. Then, one weekend I found Priscilla putting the final touches on some beautiful quilts she had handsewn. She was on her hands and knees on the expansive wooden floor of one of our university buildings working quietly on the quilts she had stretched out there. Warmly, she showed me how she had done her work and filled me in on her business of quilting and how it helped her pay her bills. After spending that time with Priscilla, I realized that I had figured her out all wrong. I had been mistaken in my judgment of her and unfortunately had missed the opportunity to get her know her better when I had the chance. Recently, I got a new book on my Kindle, “God as He Longs for You to See Him,” that talks plainly about how we often do the same thing to God. In the book, Christian author Chip Ingram explains a similar misconception he had with a fellow student in college. They both worked for a campus ministry and because of Chip’s inaccurate thoughts about her, he found himself unable to see the girl for who she really was, and their relationship suffered because of it. Chip then went on to share how what he learned related to God: “What you think about God shapes your whole relationship with him. In addition, what you believe God thinks about you determines how close you will grow toward him. Many of us have formed a picture of God from impressions we’ve picked up in passing. “If we see him as an overzealous policeman, we’ll always be walking on eggshells. If we see him as an angry judge, we’ll always feel guilty. If we think he’s just like us, we’ll be casual about our sin. But are those ideas accurate? What if they’re not true at all? A few days ago, I wasn’t feeling well. The day was dark and cold, and I was sick without a clear understanding of what was wrong with me. Slowly, I allowed thoughts of self-pity and fear to creep in and maybe even entertained the thought that God had abandoned me. After a little while, I began to notice that the intimacy I often felt with Jesus was missing. Had he really left me? Is that how he treats his children when they are in the middle of a health crisis? 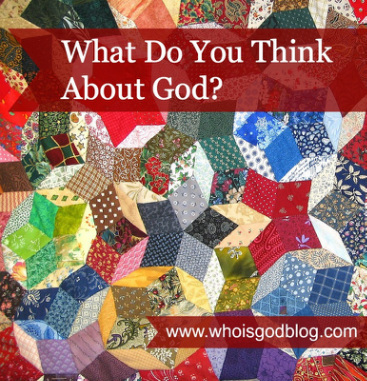 It’s amazing how we let our thoughts and perceptions of God shape our understanding of him. I guess it’s human nature and maybe some kind of “control freak” thing we do having to have him all figured out. I think we’re missing something when we let ourselves do this. We’re confining the God of the universe into our little box of our understanding. And when we’re wrong, like I was with Priscilla, we’re the ones who miss out.